I can’t believe Christmas is only two days away y’all! Which also means that my birthday is tomorrow! I have a fun little post already scheduled for you then, so make sure to check back in while you’re resting up for a fun Christmas to come. Asheville recommendations? We’re headed to Asheville, NC to celebrate New Year’s with some of our best friends. So far we have a late lunch planned with Cambron and her hubby at Curate (fun fact, it’s pronounced as Karate) and a little relaxation at a spa retreat planned for the morning after New Year’s. What else should we do? I think we’re going to skip the Biltmore and Grove Park this trip as we’ve been there so many times. What are some good brunch/breakfast and dinner places? Favorite breweries? What about where to cerebrate New Year’s? Our hotel is downtown so we’d like to stick around that area. These classic flats with a funky twist for only $25! I feel very Chanel-like wearing these and they’re such a great price. Sully with her bud Santa. I realized I never shared these photos, so had to do it here before Christmas has come and gone! She was pretty freaked out, not going to lie. I ended up sitting beside Santa, leaning way back and having them snap some really off center, but cute photos of Sully and the jolly man. He really was a wonderful Santa! Tecovas boots. I may do a full post on this company and their boots at some point, but for now just had to share a look at Ryan’s (early) Christmas present. These boots are absolutely gorgeous and hand-made in Austin, TX. This is the Bourbon Calf color and actually are darker in person than on the site. Ryan slipped them on and they fit like a glove, which is hard with his wider feet (although he didn’t order the wide). We both were so smitten the minute we took them out of the box. Five birthday inspired treats! I love the confetti and cake and celebration that comes along with a birthday, so thought I would share five fun birthday-inspired finds. Enjoy! 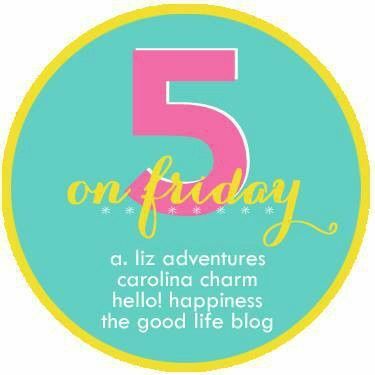 Linking up with these wonderful ladies today… A. Liz Adventures, Carolina Charm, Hello! Happiness and The Good Life. By the way, there are affiliate links in this post meaning I make some change when you click. Thank you for supporting my little blog! Five On Friday: Celebration Month Begins!